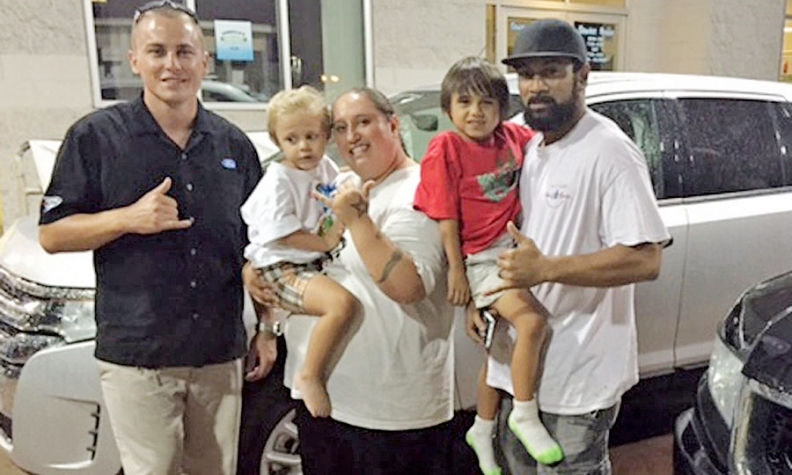 A Honolulu Ford salesman celebrates with a family whose monthly payments fell to $512 on a loan with 3.9 percent interest for a 2014 Ford Edge from $650 on a loan with 22 percent interest for a 2009 Honda Ridgeline. Honolulu Ford President Mark Benson is on a mission to save his customers money. Benson, the son of a Lutheran minister, tries to refinance customers with high-interest-rate car loans, including ones the dealership arranged. Failing that, he works to help customers trade up to a new or newer vehicle with a much lower interest rate and monthly payment. Benson is unable to arrange a better loan for about half the customers he tries to help, either because they still have credit problems or they owe more on their vehicle than it's worth. Still, he estimates he sells eight to 10 cars a month as a way to improve customers' finance rates. Honolulu Ford sold 1,517 new vehicles, or about 126 a month, in 2014. The store had revenue of $80 million. Although the opportunity to boost sales is part of the reason Benson looks to find customers a better deal, that's not his only purpose. "I have great compassion for those that are struggling to get by," Benson says. "It has always bothered me that people are forced to pay 23.99 percent interest for a vehicle to get to and from work." So two years ago, Honolulu Ford began reaching out to its customers with interest rates above 9 percent to come in and see whether they could be refinanced into shorter-term loans with lower rates. When the dealership can't find customers financing with an interest rate lower than 23.99 percent -- the maximum allowed in Hawaii, Benson says -- Benson tells them to come back in a year. "I always tell people, 'Don't sit still for this. As soon as you get your credit cleaned up, come back in, and we will do whatever we can to try to help get you a lower rate,'" Benson says. "What I find from experience is that if people make their payments on time for 12 months and don't damage their credit in another area, I can get them into a normal auto loan." The dealership does most of its financing through Ford Motor Credit Co., although it also works with local banks and credit unions. When Honolulu Ford can't help a customer refinance into a better loan on the current vehicle, the store looks to reduce the interest rate and payments by having the customer trade up to another vehicle. For example, a couple came into the showroom recently with a 2009 Honda Ridgeline that was no longer under manufacturer's warranty. They were paying $650 a month on a loan with 22 percent interest. The store was unable to get the loan refinanced because the high-mileage pickup was worth less than the couple owed on it. "No bank would take them" because of the collateral, Benson says. Benson: "Don't sit still for this." But because their credit had improved, Benson says, they were able to trade in their vehicle, thanks to some incentives from Ford, for a new 2014 Edge crossover with a 3.9 percent loan and a $512 monthly payment. "So they went from $650 a month to $512 and a brand-new car with a warranty," Benson says. "They could not have been happier." The high cost of living in Hawaii creates a lot of financially stressed customers. According to Benson, 94 percent of cars in Hawaii are financed. That's about 9 percentage points higher than the national average for new cars in the first quarter this year, according to Experian Automotive. Average loan terms also tend to be a lot longer than elsewhere, Benson says -- 78 months compared with Experian's reported national average of 67 months in the first quarter. So shaving terms and lowering the interest rate can save the customer a meaningful amount of money, Benson says. "I know that $75 or $100 a month can really change someone's life," he says. It also helps drive Benson's business. He notes that people driving older, high-mileage cars and still paying on a high-rate loan are heavily motivated to stop paying and have the car repossessed, then repeat the process. Getting them a better deal before that happens, either through a refi or a trade-in, breaks that cycle and makes for a happier customer. But Benson isn't always looking for an immediate benefit. If the store can't help a customer today, chances are it will later, perhaps with an opportunity to sell to a family member or friend as well. He says helping customers spreads good word-of-mouth about his dealership, creating more business down the road. For example, a soldier came into the dealership one recent Saturday and spent more than an hour shopping for a car but was turned down for a loan. Benson is confident he'll come back and try again. "That person is going to come back in a year or 18 months. He's going to come back to the place that treated him well. And he's going to go back to the Army base and tell everybody," Benson says. "I'm going to get more business from our conversation than the time that we invested in it." Building customers for the future has become lost in today's car-selling business, Benson says. "I think we are shortsighted. We miss that part in our business," he says. "We are so focused on what we can sell today that we miss the point about priming the well. I don't think we are as good in that area in our industry as we should be. "At the end of the day, if we can help people, if I can do good business and take care of our customers, it's going to build my volume in the long run."